Summer is the time for family trips, but most families don't take over 5,000 of them! 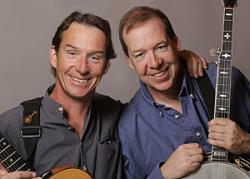 The Dady Brothers are an exception; the 2 brothers have performed from Alaska to Ireland and from the Caribbean to Nova Scotia. Now, Hochstein at High Falls is bringing the duo to you during your lunch break! The Dady Brothers are Western New York’s favorite troubadours. The musical duo have been performing and winning the hearts of crowds professionally for more than 40 years. John and Joe Dady’s music transcends genres and generations by melding American folk roots and Irish traditional influences into an amalgam of sound that is uniquely their own. Their instruments include guitar, four- and five-string banjo, pennywhistle, ukulele, fiddle, mandolin, bodhran, harmonica, concertina, and the uilleann pipes. Check out www.dadybros.com to learn more!